Standard raised bed food gardens are "Ready to Plant" - constructed, installed, and filled with Man in Overalls' Magic Mix. They come in a variety of squares and rectangles including 2x8, 3x3, 3x8, 4x4, 4x8, 4x10, 4x12, 4x16, and more. 4x8 is the most popular. You can choose from a variety of material options including yellow pine, cedar, treated pine, or plastic composite lumber. All raised beds can come complete with automatic micro irrigation, food garden planting service, and ongoing maintenance and food garden lessons to ensure your success this year and season after season. 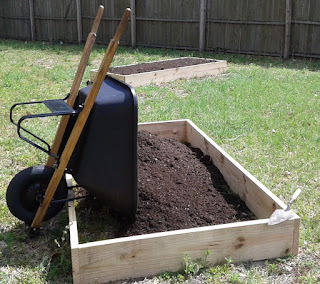 Click here to purchase a "Ready to Plant" raised bed. CLICK HERE to book a site visit on my services page to get started with a custom raised bed. Custom raised bed food gardens are designed to fit your space and preferred design aesthetic. Like standard beds, they are "Ready to Plant" - constructed, installed, and filled with Man in Overalls' Magic Mix. They come in all shapes and sizes, from oddly-angled beds to octagonal fruit-tree planters to table-top patio herb gardens; built with a "picture frame" kneeling lip or using landscape timbers, cypress, or castle rock. If we can think it, we can build it. 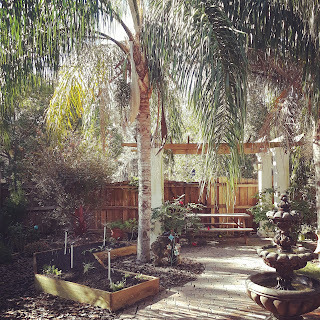 All raised beds can come complete with automatic micro irrigation, food garden planting service, and ongoing maintenance and food garden lessons to ensure your success this year and season after season. CLICK HERE book a site visit on my services page to get started. To request a quote for Magic Mix & "Ready to Plant" raised beds, CLICK HERE. Man in Overalls' Magic Mix is a custom compost-based soil mix, perfect for raised bed food gardens. The ingredients are mushroom compost enriched with composted cow manure, organic fertilizer, rock dusts (granite & azomite), and kelp meal to fill out its micro nutrient profile. I have been growing in and improving my Magic Mix for the past 8 years that I've been in the food gardening business. I use it to fill all of my raised bed food gardens. After the first season, you simply top-dress before planting with another few inches-- enough to refill your beds-- of Magic Mix. This is how I manage my own food garden fertility and how I help my customers grow productive gardens year after year. *I offer significant discounts for schools, nonprofits, and orders over 10 cubic yards. 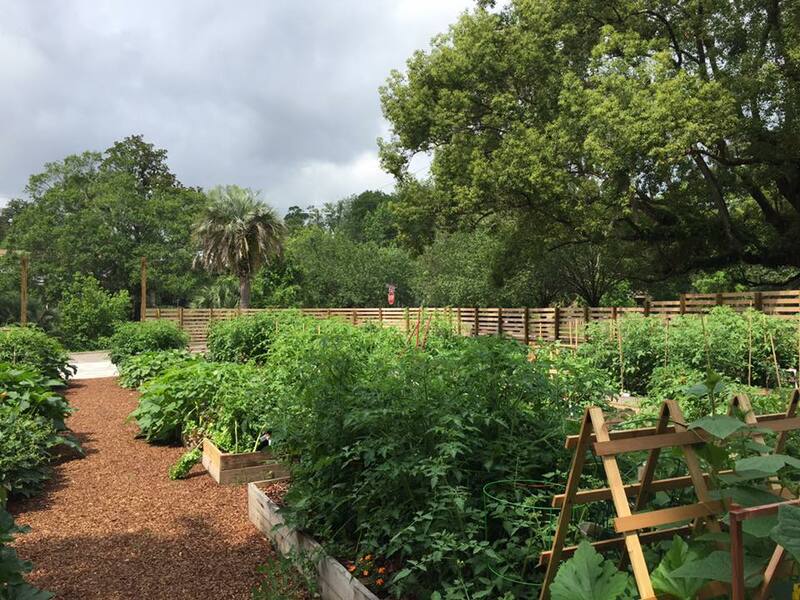 A Riverside Avondale Community Gardener here in Jacksonville said, "I don’t think we understood what good soil meant…..until now. The rate of growth and the health of the plants has been noticed- I think every visitor asks where we got the soil! 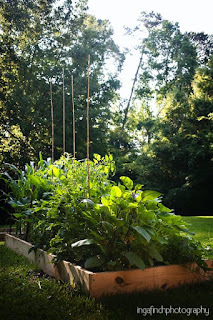 The tomatoes are 6+ feet tall and the cucumbers are so prolific we are giving them away!" Another customer, Suzanne struggled to grow "normal-sized vegetables" for years until I filled her beds with Magic Mix. She said, "Your soil makes me feel like a master gardener." Sylvia, an expert gardener herself asked for help expanding her garden space and insisted I fill her beds with "that magic soil!" of mine. I literally have people driving by my house who, seeing my food garden out front, pull over, park, walk up to my front door, and knock. Dog barking, I answer the front door. "I was driving by," they say, "and I just had to ask, 'What kind of soil have you got in your garden?' It looks beautiful. It's some kind of magic!" I also sell "Magic Dust" which is my custom supplement of organic fertilizer, granite & azomite dusts, and kelp meal that I add to my Magic Mix for fruit trees or beds too full to topdress that, nonetheless, need supplemental nutrition. Trellises, tomato stakes and ties, personalized food garden planting maps, organic pest management supplies, pathways and fences, cold-frames.... My mission is to inspire and support folks to grow food for self and neighbor, so if you need it to successfully grow your groceries, I'll find a way to get it in your hands.